Kaisa Pfoze with her best film award. 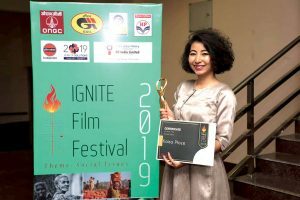 Dimapur, Feb 8: Budding filmmaker Kaisa Pfoze from Manipur won the best film award at the recently concluded Ignite Film Festival in Bhubaneshwar, Odisha on Feb. 7 for her documentary ‘Sunset Years’–based on old age in India and how society deals with the aged. She was the director as well as the producer of the documentary. Speaking to Eastern Mirror over the phone, Pfoze said this year’s theme for the film festival was ‘social issues’ for which she sent her film; and after “much scrutiny” was nominated, before being ‘honoured’ with the award. “A three member jury scrutinised the film and they appreciated the content, apart from the research that went into making the film,” she said. According to her, the documentary took four years to complete, after lots of research. “The subject of senior citizens and old age is vast and I did not want to hurry in researching whatever I could,” said Pfoze, adding that she faced many challenges during the making of the documentary. “Apart from researching, there were many issues I couldn’t address in my film because language was a barrier as well,” she said while explaining that even though everyone speaks Hindi in India, it varies from state to state. When asked what inspired her to choose the issue of old age, the young director said it started after the passing of her mother. “After my mother passed away, my dad also had to be taken care of and since I was living away from home, certain social arrangements had to be made which seemed difficult at first. “There aren’t many schools or institutes that offer courses and training on how to take care of senior citizens, the subject is still very new,” she remarked. ‘Sunset Years’ revolves around the young generation in India with a growing aging population. Apart from highlighting certain unique approaches towards aging and the different kinds of mechanisms involved, the director informed that she emphasised on the “highs and lows of the present days’ aged inhabitants of India” through the life of happily-retired Dada Dadi Park Cricket team Mumbai; the never-give up Parkinsons Movement and Disability Society Mumbai; and poor, neglected, helpless elderly of Mumukhshu Bhavan, Varanasi. As the film progresses, Pfoze takes the story deeper back to thousands of years where the Tamil community buried the immobile-aged alive. The director said that this “social act” continues in the present day but in a different form known as ‘Thalaikoothal’; making the documentary speak about not only the present scenario but also the past and the future as well. “A new social design has to come in place where both the young and aged can communicate and come to a common ground,” she said. The Delhi-based director is looking forward to making more films, and slowly venturing into feature films.